Would you like to know how I search LinkedIn when sourcing for talent? I don’t have a premium LinkedIn account, so you may be surprised to learn that I don’t X-Ray search LinkedIn all that often. I’ll tell you why in a moment, but first I would like to share my inspiration for this post. I recently read a great post that addressed an issue with X-Ray searching LinkedIn and that pointed out that pattern recognition is critical to effective online sourcing. Suffice it to say I wholeheartedly agree that is it more important to have the right investigative thought process than to have any specific Boolean search string or pre-built X-Ray search. As an added bonus, you’ll also find that I’ve discovered that Bing and LinkedIn apparently don’t play well together anymore, and I’ll issue a LinkedIn Sourcing Challenge to the international sourcing and recruiting community to crowdsource the solution. 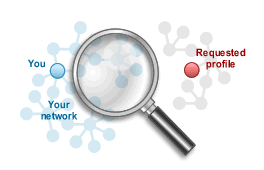 In the aforementioned article, the author suggested to search for the phrase “contact settings” in Google X-Ray searches of LinkedIn to isolate public profiles from non-profile false positive search results rather than using slightly more labor/Boolean intensive search logic such as the example they use site:ie.linkedin.com (inurl:in | inurl:pub) -inurl:dir -inurl:title “primary school teacher” or even one of my takes on the same search: site:ie.linkedin.com in | pub -dir “primary school teacher” (short and sweet!). I’ve searched for other terms on LinkedIn that are well-indexed, but I had never tried the “contact settings” phrase before, so I immediately tested it and it seems to work quite well to isolate profiles from non-profile results. You’ll notice that if you click the links for the search results above, I take you to the last page of results. That’s because no one should care about Google’s estimated number of results that show up on page 1 – you should always click through to the last page. At that point, you can click Google’s “repeat the search with the omitted results included” – although you still won’t get the number of results that Google estimated page 1 if you click through to the last page, and you gain mostly (if not all) duplicates. They probably didn’t, but if anyone at LinkedIn actually thought to design any part of that section to make it more difficult to precisely X-Ray search LinkedIn, my hat’s off to you – it’s good work. Intentional or not, that part of public profiles is responsible for producing a solid quantity of false positive results – profiles that actually don’t match your search. I’m glad you asked, because I actually took the time to find out – at least with the search suggested by the www.socialtalent.co blog author. Out of the first set of results from the site:ie.linkedin.com “Contact Settings” “Primary School Teacher” search, without clicking to search with the omitted results included, I got 270 results. I scraped all 270 results into Excel and sorted them by name. Of those 270, there are 193 unique names, leaving 77 duplicate names – which is nearly 30%. 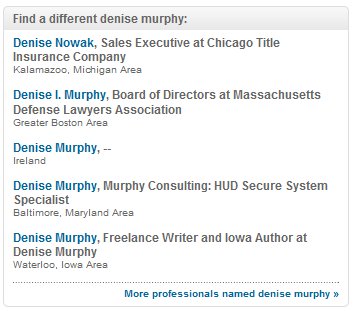 There are a few duplicate profiles of people who obviously created one LinkedIn profile, abandoned it and/or simply created another one – here is one example. However, the vast majority of the duplicates come in the form of false positive results of people who share the same name of a legitimately matching positive result, but when you click through to their profile, there are clearly a false positive, as the phrase “primary school teacher” cannot be found anywhere on the profile. In many cases, not even in the box of false positives. 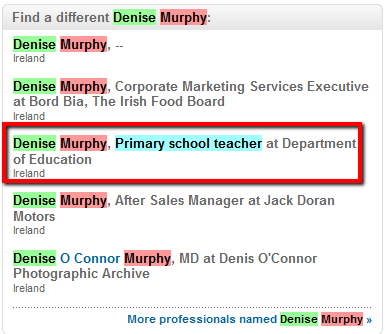 So, while the actual profile page on LinkedIn doesn’t currently have any mention of “primary school teacher,” it did actually have a mention of “primary school teacher” from the “More professionals named _______” box the last time Google took a snapshot of that person’s public profile. By the way – has anyone else noticed that Google’s cached results are acting buggy lately? Now that you have seen perhaps one of the largest flies in the ointment of LinkedIn X-Ray search (nearly 30% false positives), let me tell you how I personally go about searching LinkedIn. I start searching LinkedIn using LinkedIn’s search interface 100% of the time. The only time I really X-Ray search LinkedIn (other than tinkering around) is to find the specific public profiles of LinkedIn search results who are beyond my LinkedIn network. I’ve found that when I grab phrases or combinations of terms from LinkedIn profiles that are beyond my LinkedIn network and search for them on Google or Bing, I typically get very “clean” results – in other words, the profile i am looking for, without a load of false positives. Ultimately, I have found that the return on time invested when searching LinkedIn is higher when you start with LinkedIn and use Internet search engines to find the profiles of specific people, as opposed to starting a search with an Internet search engine to X-Ray LinkedIn to identify people. LinkedIn No Longer Plays Nice with Bing? As a timely example of point #3 above, I was going to use Bing to demonstrate a few things in this post – specifically to show how use can use Bing to create a very concise and simple X-Ray search that only uses the word “powered” to target public profiles. However, I have found that something has changed significantly with how well Bing and LinkedIn play together. For example, check out how only 28 results come back from this Bing search: site:ie.linkedin.com. Interestingly, Yahoo’s Site Explorer pulls over 550,000 results. Google pulls over an estimated 800,000 results with the same simple search. Also interesting is that a simple search like this site:linkedin.com java “greater atlanta area” on Bing only pulls 44 results, when it should pull tens of thousands of results with a load of false positives, as it does on Google. Score 1 for Team LinkedIn if they had anything to do with recently altering Bing’s heretofore superior LinkedIn X-Ray search results. If anyone has any insight into the very recent changes in Bing X-Ray searches of LinkedIn, please let me know. Let’s crowdsource a LinkedIn sourcing solution! Similar to my recent LinkedIn Sourcing Challenge to eliminate location-based false positive results, I’d like to challenge the international sourcing and recruiting community to come up with LinkedIn X-Ray searches that only return profiles that match the keywords searched for, and do not return any false positive results coming from the “Find a different ________” box of false positives.